In his Introduction to this collection of essays on Australia- and New Zealand-based jazz, editor Bruce Johnson traces the music’s status as ‘the soundtrack to modernity’ back to the fact that ‘Jazz was not invented then exported, arriving in some contaminated and enervated form, but was continuously invented in the diasporic process, which thus contributes to, rather than compromises, the jazz tradition.’ His collection accordingly challenges ‘entrenched jazz narratives, by breaking down simplistic binaries such as “centre (US)/margins (the rest)”, or based on essentialisms of place, gender and race’. Assigning the fourteen essays to three categories – ‘Cultural Contexts’, ‘Infrastructures’ and ‘Musicians’ – Johnson presents a set of carefully focused snapshots of the music’s antipodean history and current practices. 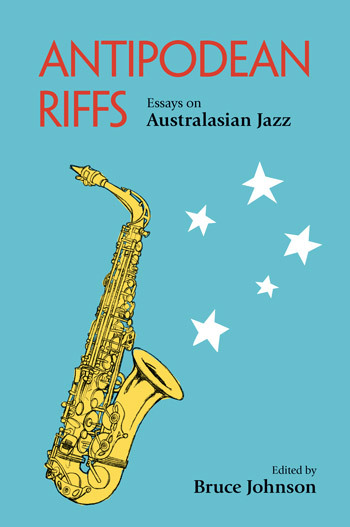 In the collection’s first essay, for instance, John Whiteoak accounts for Australia’s ready adoption of jazz’s ‘oppositional spirit’ by referring to ‘the “down-under mateship” of two “demons”: the melding of American notions of egalitarianism, irreverence, independence, racism, “boosterism” and “breeziness” … with a type of Australian “larrikinism” that was no doubt influenced by our foundational criminality’. Aline Scott-Maxwell traces the fascinating intersections between ‘oriental exotica’ and Australian attitudes to early jazz, drawing intriguing parallels between what she refers to as the self-orientalisation of Chinese performers in Australia and the blackface tradition in minstrelsy. Bruce Clunies Ross chronicles the ‘Australian sound’ achieved by Melbourne and Adelaide jazz bands in the 1940s (touching on the extraordinary hoax, the Ern Malley affair, in the process); Pierre-Emmanuel Seguin traces the influence of George Russell’s theories on Australia’s jazz scene; Jane Galbraith concludes the collection with a percipient study of the ‘extensive use of repetition and minimalism’ of Australia’s best-known contemporary jazz export, the Necks. There may still be diehards who subscribe to the ‘jazz is an American artform palely and inauthentically imitated elsewhere’ theory, but – as Johnson’s collection so vividly demonstrates – current jazz scholarship rejects this notion, teaching, in the process, ‘lessons about the music that are unavailable to the old centre/margins jazz discourse … in turn [providing] a broader understanding of the diffusion of music and culture in a world globalized by the modern media … [and of] regionalism in general’. UK-based readers may be tempted to skim the odd chapter scrupulously detailing players of whom they are unlikely to have heard, but there are gems to be found by a little judicious googling (see, for instance, this video of Georgia Lee from 1962 or this site dedicated to the Ern Malley affair), and, overall, this is an absorbing, valuable and thought-provoking set of essays.